This evening was my first visit to the Upper GT stand since the commemorative posters were put up. Each one of them evoked memories that brought a smile to my face and a tear to my eye. But tonight was about the future. The starting line-up included the permitted three overage players plus an overage goalkeeper and was Gilmartin, Doherty, Savic, Young, Martin, O’Nien, Byers, Murray, Mensah, Ranegie and Fabbrini. Apparently Savic is a Serbian triallist. Among the crowd, it was lovely to see David Hughes back to see the youngsters that he used to train. As the teams emerged from the tunnel the ref decided that they should face the SEJ stand for the respect handshakes. This benefitted their non-playing team mates and the benches, but meant that they had their backs turned to all the paying punters. The visitors started brightly but Watford took the lead in the fourth minute. Luke O’Nien, fresh from his goalscoring exploits for Wealdstone against home town club, Hemel, advanced to the edge of the box and as Don was yelling “Not from there,” belted it into the top corner. A couple of minutes later Fabbrini went on a great run and passed to O’Nien whose shot from the angle was pushed out by the Leeds keeper, Grimes. From our viewpoint, the corner appeared to have been headed the other side of the post, but Grimes emerged with the ball that he had retrieved from the net and the lino signalled that Doherty had scored. It wasn’t all Watford, Leeds had a chance to reduce the deficit when a clearance came back to Stokes but Gilmartin was behind his shot. Then Phillips got on the end of a cross from Dawson but headed over the target. 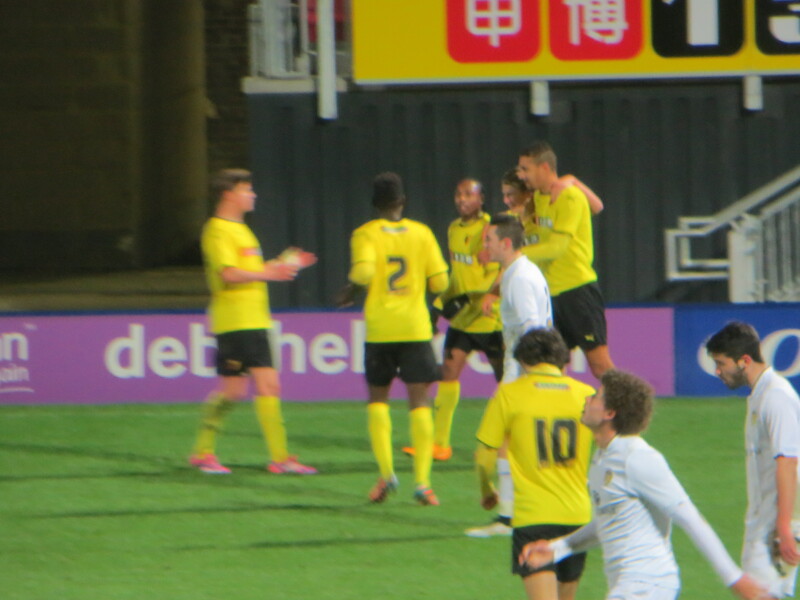 Murray played a one-two with Fabbrini, his shot from an angle bounced off the inside of the far post, Skelton’s attempted clearance hit Mensah and flew in to put Watford three goals up after 21 minutes. Watford’s fourth came 15 minutes later as Fabbrini released Martin whose cross was met by Ranegie, his shot was blocked but the ball fell to O’Nien who made no mistake for his second goal of the night. The fifth came soon after as Fabbrini hit a lovely curling shot into the top corner. The first booking of the evening went to Purver of Leeds for clattering O’Nien, who was proving to be a menace. In the dying minutes of the half, Leeds tried to strike back as Stokes broke clear and unleashed a shot but it was over the target. It had been a tremendous half of football by the young Hornets who had hardly let the visitors have a sight of the ball, played some lovely passing football and been clinical in their finishing. Fair play to the Leeds team, then, for coming out and having a go in the second period. They had a shot in the first minute of the half, but Parkin’s shot was blocked by Gilmartin. Booker was the next to have a go, his shot was blocked and fell to Parkin whose strike was easily caught by Gilmartin. At the other end, Murray tried a curler from distance but it flew past the far post. Parkin continued to threaten as a low cross was cut out by Doherty. A lovely Watford move finished with a low cross/shot from Martin which Grimes pushed around the post. The second Leeds booking went to Parkin, again for a tackle on O’Nien. This had been a good spell for Watford, but Leeds were still pressing as a shot from distance from Skelton flew high and wide. 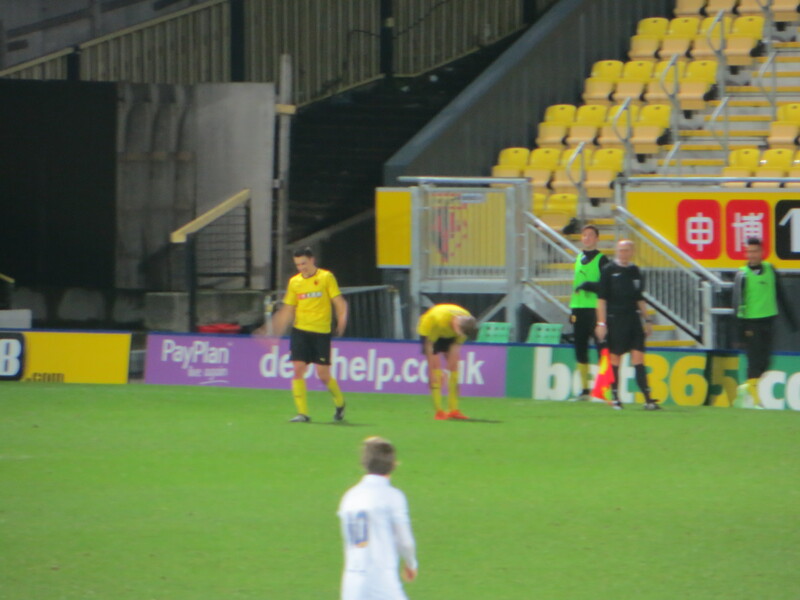 Watford made their first substitution just after the hour mark with triallist Savic, who had a decent game in the centre of defence, making way for Rowan. Watford’s sixth goal came soon after as Ranegie ran into the box, held off the defender and shot into the roof of the net. 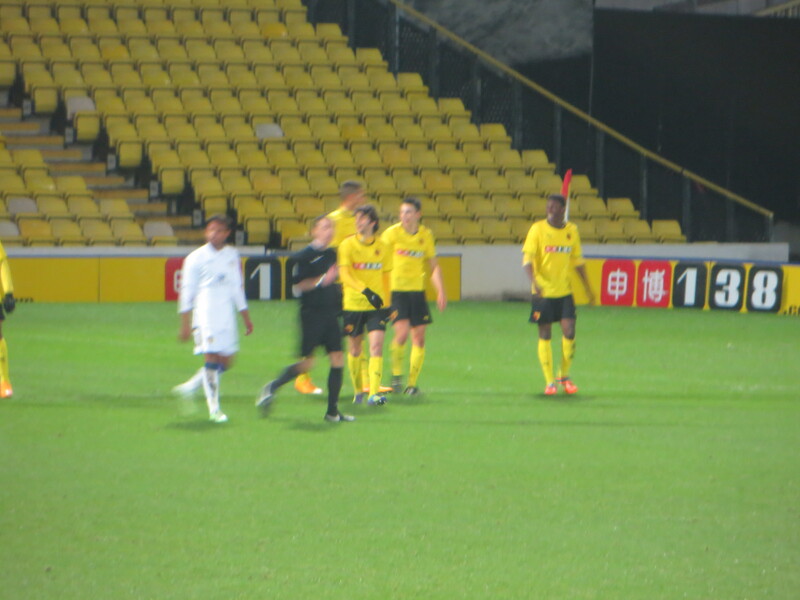 Watford made another change with Lewis coming on for Martin, so Mensah moved to the left. I take full responsibility for the Leeds consolation as I commented that we might have won this game just before Phillips won a tackle and advanced into the box before playing the ball back to Dawson who beat Gilmartin. Watford continued to threaten the Leeds goal as Fabbrini passed to Lewis who picked the ball up at the corner flag and did really well to keep it in and beat the defender to get in a low cross, but nobody could apply the finishing touch. A Murray free-kick into the box reached Ranegie, but he got under the header and it looped over the bar. At the other end, Phillips had a free header from a cross to the far post but directed it into the side netting. 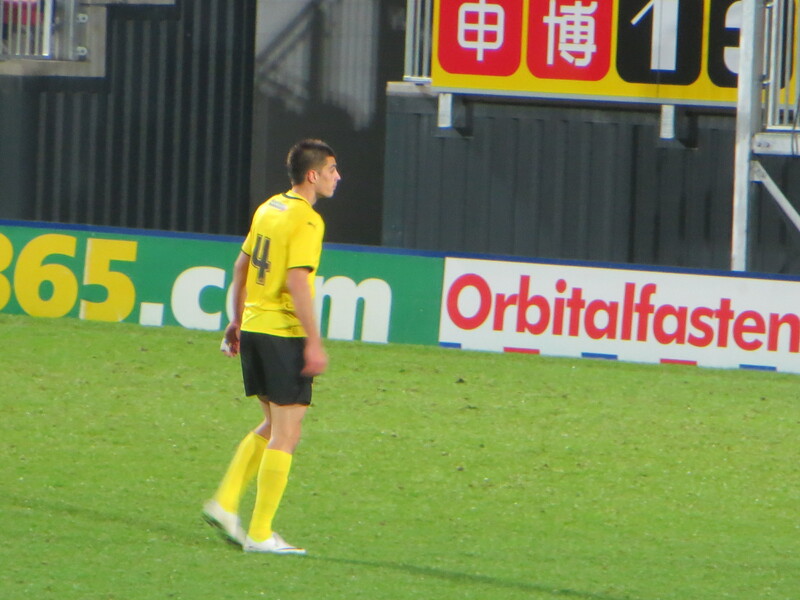 Watford’s final substitution saw Folivi come on for Fabbrini. Gilmartin had to drop to save a low shot from Leeds sub Mulhern. With 10 minutes to go, Watford were down to ten men as Mensah limped off. O’Nein, who had so often been on the wrong end of Leeds tackles, got his own back and was booked for taking down a Leeds player as he tried to break. Leeds hadn’t given up and a looping cross was headed goalwards by Mulhern but Gilmartin was there to gather the ball. Ranegie was booked after complaints from the Leeds players that he had used an elbow. Mulhern had been a constant danger since he came on, so it was a relief to see his cross/shot tipped over by Gilmartin. Leeds earned another booking as Phillips was penalised for taking Lewis down as he attempted a break. In time added on there were chances for both sides as, first, Folivi tried a shot from distance that was easy for Grimes then Mulhern came for a header, but the challenge of Gilmartin ensured that he directed it over the bar. So, an impressive win for the youngsters but the visitors certainly deserved great credit for not giving up despite being 6-1 down. Finally, thanks must go to Dave, the steward in the Lower GT disabled enclosure who was beyond helpful in ensuring that we got out of the stadium with the minimum of effort. This entry was posted in Watford FC and tagged Alex Purver, Alfie Young, Bernard Mensah, Charlie Rowan, Chris Dawson, Dennon Lewis, Diego Fabbrini, Eoghan Stokes, Eric Grimes, Frank Mulhern, George Byers, Jake Skelton, Josh Doherty, Kalvin Phillips, Leeds United FC, Lewie Coyle, Luke Booker, Luke O'Nien, Luke Parkin, Mahlondo Martin, Mathias Ranegie, Michael Folivi, Rene Gilmartin, Ross Killock, Sean Murray, Tyler Denton, Vujadin Savic, Watford FC on January 7, 2015 by franelynn.